Rocks are made of grains that fit together. Each grain in the rock is made from a mineral, which is a chemical compound. The grains in a rock can be different colours, shapes and sizes. Granite has interlocking grains. Sandstone has rounded grains. Some types of rock have interlocking grains that fit tightly together. Granite is a rock with interlocking grains. Other types of rock have rounded grains. Sandstone is a rock with rounded grains. Rocks with rounded grains are more likely to absorb water than rocks with interlocking grains. This is because the water can get into the gaps between the grains. Rocks that absorb water are called porous. Rocks with rounded grains are usually softer and more crumbly than rocks with interlocking grains. So porous rocks tend to be softer than non-porous rocks. There are three main types of rock: sedimentary, igneous andmetamorphic. A river carries, or transports, pieces of broken rock as it flows along. When the river reaches a lake or the sea, its load of transported rocks settles to the bottom. We say that the rocks are deposited. 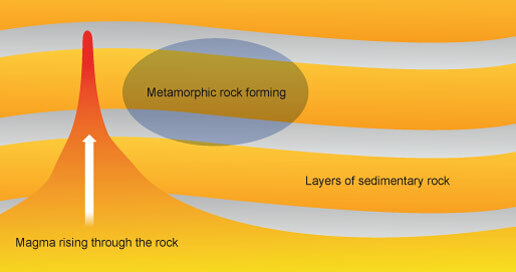 The deposited rocks build up in layers, called sediments. This process is called sedimentation. The weight of the sediments on top squashes the sediments at the bottom. This is called compaction. The water is squeezed out from between the pieces of rock and crystals of different salts form. The crystals form a sort of glue that sticks or cements the pieces of rock together. This process is called cementation. These processes eventually make a type of rock called sedimentary rock. 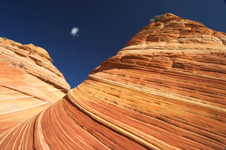 It may take millions of years for sedimentary rocks to form. The oldest layers are at the bottom and the youngest layers are at the top. 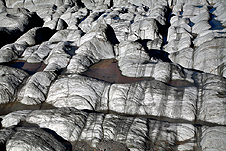 Sedimentary rocks may contain fossils of animals and plants trapped in the sediments as the rock was formed. The second type of rock we’ll look at is igneous rock. The inside of the Earth is very hot – hot enough to melt rocks. Molten (liquid) rock forms when rocks melt. The molten rock is called magma. When the magma cools and solidifies, a type of rock called igneous rock forms. Igneous rocks contain randomly arranged interlocking crystals. The size of the crystals depends on how quickly the molten magma solidified. The moreslowly the magma cools, the bigger the crystals. You may have done an experiment at school with a substance called salol. If molten salol cools slowly, you get big crystals. If it cools quickly, you get small crystals. If the magma cools quickly, small crystals form in the rock. This can happen if the magma erupts from a volcano. Obsidian and basalt are examples of this type of rock. They are called extrusive igneous rocks because they form from eruptions of magma. If the magma cools slowly, large crystals form in the rock. This can happen if the magma cools deep underground. Granite and gabbro are examples of this type of rock. They are intrusive igneous rocks because they form from magma underground. Unlike sedimentary rocks, igneous rocks do not contain any fossils. This is because any fossils in the original rock will have melted when the magma formed. Metamorphic rocks are the third type we’ll look at. They formed from other rocks that are changed because of heat or pressure. Earth movements can cause rocks to be deeply buried or squeezed. As a result, the rocks are heated and put under great pressure. They do not melt, but the minerals they contain are changed chemically, formingmetamorphic rocks. Sometimes, metamorphic rocks are formed when rocks are close to some molten magma, and so get heated up. What are metamorphic rocks like? When a metamorphic rock is formed under pressure, its crystals become arranged in layers. Slate, which is formed from shale, is like this. Slate is useful for making roof tiles because its layers can be split into separate flat sheets. Marble bedrock on the coast. Marble is another example of a metamorphic rock. It is formed from limestone. Metamorphic rocks sometimes contain fossils if they were formed from a sedimentary rock, but the fossils are usually squashed out of shape.